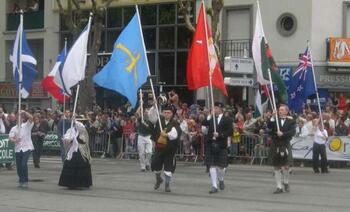 The Interceltic Festival of Lorient (en) (or Gouelioù Etrekeltiek An Oriant (br)) was founded in Lorient, Brittany in 1971 by Polig Montjarret. This annual gathering takes place in the heart of the city every August and features Celtic traditional, classical, folk, jazz and rock musicians, singers, dancers, painters, sculptors, writers and other artists.They come from Brittany, Cornwall, Wales, Ireland, Scotland, the Isle of Man*, Cape Breton Island, Galicia, Asturias, and the entire Celtic diaspora. The main festival sites are located throughout the city. The more formal events take place at the Palais de Congrès, Grand Théâtre or Eglise Saint Louis. The larger events take place at the Parc de Moustoir (the home of Lorient Football Club which can hold up to 10000 spectators), the Port de Pêche or in grand marquees. The festival begins with the Cotriade (fr) or Kaoteriad (br), a traditional Breton seafood supper, which takes place in the Port de Pêche (fr) or Porzh Pesketa (br) harbour district accompanied by sea shanties and traditional Breton marine music. On Sunday morning the spectacular Grand Parade of Celtic Nations takes place with over 3500 musicians, singers, pipebands and dancers from all over the Celtic world parading through the city streets in national costume. The finals of the National Bagadoú Championship takes place at the Parc de Moustoir during the first weekend of the festival, with strong competition between Brittany’s finest pipebands. In addition individual competitions take place for pipers. For those early risers, Master classes take place each morning with some of the world’s premier harpists, accordionists, fiddlers and pipers. Every afternoon hundreds of performers appear in folk and traditional music concerts and dance displays, and again in the evening there is a choice of several major events , including orchestral concerts, rock concerts and the not to be missed “Nuits Magiques”, spectacular displays of pipe bands, dancers, choirs and fireworks! Throughout the festival the “Village Celtique” (fr) or “Marc’had Etrekeltiek” (br) is open in the centre of the city offering food, music and literature, clothing and crafts. On the final Saturday of the festival the focus again returns to the fishing harbour for the Nuit de Port de Pêche, featuring the best of Brittany’s folk and rock musicians. There is, of course, much activity on the festival fringe, with musicians giving free performances in many of the city’s bars and pubs every evening until late. The festival organisers have more recently embarked on similar ventures such as the St Patrick's Day concert in Paris, France which attracts a crowd of 70,000 spectators and the Celtica concert in Nantes, Brittany. Annual dates: from the first Friday to the second Sunday of August. Organisation: International event. Contacts in all the regions and countries concerned (400 people are involved in ensuring that everything runs smoothly). All the organisational activities are managed directly (Transportation of 4500 people, 50,000 meals, 12,000 nights of accommodation, international public relations, finding sponsorship, looking for new talent, staging, creating shows). Located in the Irish Sea, the 570 sq. km. territory of the Isle of Man has 60,000 inhabitants, half of whom live in the old-fashioned seaside resort Douglas. This autonomous tax haven inherited the oldest parliament in the world from its Viking conquerors, the parliament has been operating on the Celtic hill Tynwald for more than a thousand years. History books somewhat unflatteringly sum up the Celts as being nice barbarians who were crushed by the Roman legions for their own good. The reality is different however. They were the strongest nation in Europe whose land stretched from the Black sea to Ireland, probably the first union in europe. Forerunners of non-figurative art, they were the first to work with iron when the Greeks and Romans were still using bronze. They invented all the basic tools used up until recent mechanisation. Thousands of our rivers, valleys and towns have kept their Celtic names. One of the first and foremost examples of this is "Paris" which the Romans wanted to call "Lutèce". Tristan and Iseult, King Arthur, Merlin and the Knights of the Round Table all feature strongly in today's global cultural imagination. "Halloween", the Celtic New Year, is back in fashion and these inventive, brave and sometimes revelling ancestors, previously considered to be stifled by history, have sprung back to life. 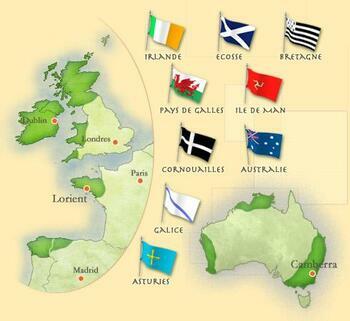 Now a days, some "countries" like wales, scotland, brittany want their independence from UK and France but they also want to create a european union of celts. It's a paradoxe because they to have their own countries, so an augmentation of countries in Europe, but they want it to be unified in a same "Celts' union". I think in this period which in Europeans wants to be unified, we could, maybe, more underline this common past.